The company has been a pioneer in producing this type of plastic card for the market São Paulo, October 30, 2009. 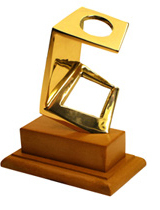 IntelCav was the winner of the 2009 edition of the Eco Award in the “Sustainable Product” category. The award was achieved through the ecological cards project that the company developed by recycling PET bottles. Producing 10,000 cards uses approximately 832 2-liter PET bottles. Created in 1982 by the American Chamber of Commerce (Amcham), the ECO Award was a pioneering initiative to recognize countries that adopt sustainable practices. The name “ECO” was created by joining the words “empresa” and “comunidade” (company and community) which demonstrated the interest in transforming the word into a tool that could marshal corporate commitment to social development. IntelCav is one of the largest plastic card manufacturers in Brazil. The company’s president, Fernando Castejon, stresses the relevance of earning the Eco Award – not only for the company but also for the card segment. And he adds that IntelCav is one of the first companies in the sector globally to see this product approved and produced by complying with the demands of the financial market. “The project has a strong socio-environmental appeal because it encourages a change of attitude towards preserving the environment,” he says. “In order to achieve this level of manufacturing, the company has developed various production techniques and created a product that unites resistance with adaptation to printing processes, which allows large-scale production. A recycled card is more resistant and has minimal impact on the environment because it is made from renewable resources, which diminishes the use of natural resources. It also encourages social inclusion. All of this is a growing trend in the sector, and as pioneers in this innovation and winners of the Eco Award, we at IntelCav feel very honored,” he says. On November 26, 2009, IntelCav was selected as the winner of the 19th Fernando Pini Prize for graphic excellence by the Brazilian Printing Industry Association (Associação Brasileira da Indústria Gráfica - Abigraf Nacional) for their IntelCav Cartões. The company won in the “printed laminated cards in plastic” category. The awards ceremony is considered Brazil’s largest printing industry event, and was held at Expo Barra Funda in São Paulo on November 24, 2009. Awards in 63 categories were given. IntelCav President, Fernando Castejon, stated that this award signifies recognition of the company's strategic precision. “High quality production is one of our main competitive advantages,” he said. Marketing Manager Soraya Rodrigues said that IntelCav is investing heavily in technology and training for its professionals in order to reach an even higher level of printing excellence. “Winning the Fernando Pini prize is proof of the printing excelence of the cards produced in our factory in Getúlio Vargas”, she said.